Is love about dying for the one you love or living every breath with him? Swapping love notes… exchange roses in Valentine's day is what real love is all about? Normally, we associate these ideas of love with couples who meet, date, and fall head over heels for each other. Very rarely do we relate these images to married couples. Moreover, we almost never connect this perception to Muslim couples, who marry according to purely Islamic customs. Although this link is quite rare, there actually exists an example in Islaam's own history, which not only depicts this kind of love but goes far beyond it. This is the pure, married love between the Prophet Muhammad and his beloved, Lady 'Aa'ishah. The two came together in circumstances that are a stark contrast to today's conventional love story. He was a devoted Messenger of God, embarking on the third year of prophethood; she was the daughter of his best friend and companion, Abu Bakr. The compassionate nature of the Prophet made a tremendous impact on the strong woman 'Aa'ishah went on to become. The early years of their marriage began quite innocently. Although 'Aa'ishah was a young bride, she was in the standard marriageable age that the Arabian culture approved of and encouraged at that time. There is clear evidence that 'Aa'ishah had already been engaged to another man before her engagement to the Prophet. Though 'Aa'ishah was ready for marriage life, the Prophet preferred to grant her extra support in her transition to life as a married woman. She carried on with the many joys of childhood and fortunate for her, as she had a husband gentle and kind enough to understand this. Rather than throwing all the responsibilities of a wife on her at once, the Prophet made the marriage and its duties a gradual process for Aishah and ensured that she made a smooth transition into her new life. The compassionate nature with which he nurtured 'Aa'ishah in her early years as a wife made a tremendous impact on the strong woman she went on to become. As the so called "honeymoon period" between the couple came to an end, many challenges and trying moments began to arise. In the midst of all the mayhem, this blessed couple still took time out for simple fun and laughter. Aishah fondly recalls memories of racing with the Prophet and even winning the race when she was young and fit (Ibn Al Jawzi, 68). They enjoyed these races so much that the couple even raced to the Battle of Badr which was one of the most important battles in the Islamic history. 'Aa'ishah would take a sip and then the Prophet would do so from the same spot her lips touched. The romance in this marriage was not limited to just fun and games. As their marriage continued, intimacy was ultimately inter-woven in their daily affairs. They would sit and eat together and 'Aa'ishah would take a sip and then the Prophet would do so from the same spot her lips touched. She would have some meat or chicken, and then he would eat from the same spot she ate from. This is just one of many ways they infused romance and affection in even the simplest of acts. These small gestures show that in this marriage, romance was not a superficial bouquet of roses. Rather, it was natural and existed in their everyday life. Love has several expressions. However, it is known to all and sundry that for a woman, nothing expresses love like the words a man simply speaks from his heart. The Prophet was most forthcoming in expressing his love for 'Aa'ishah and this is evident in multiple sayings (ahaadeeh) in which he publicly declares that 'Aa'ishah is the most beloved to him. Such profound love he held for his wife that he referred to her as one with the complete qualities of a believing woman. This is a clear sign of the kind of respect he held for his wife. This respect was possible because he actually put forth the time and effort in getting to know and understand his wife enough to recommend her as an example for other women to follow. A crucial dimension to their equation was the student-teacher relationship they shared. 'Aa'ishah's enthusiastic and inquisitive nature made her one of the foremost students of the Prophet. 'Aa'ishah was a woman of substance who was never afraid to stand up for truth and justice. Sent as a teacher to mankind, the Prophet implemented this role most effectively in his very own home. The Islamic virtues and way of life 'Aa'ishah learned and carried out were essentially through watching the Prophet and keenly observing his behavior and mannerisms. Far from being meek and oppressed, 'Aa'ishah was a woman of substance who was never afraid to stand up for truth and justice — whether that meant defending herself or her beloved husband. She participated in battles when she was able to and played whatever role she could in supporting the Prophet in his endeavors. There was something quite distinct about 'Aa'ishah which drew the Prophet so close to her. Her quality of being content regardless of circumstances helped her overcome many challenges she faced as the Prophet's wife. There was a time in the Prophet's home, when they had no fire or food for cooking and they simply lived off of dates and water. Yet 'Aaishah went through this hardship and showed the mark of a true companion — one who can offer unrelenting support even under the most trying circumstances. A truly dynamic woman, complete with the qualities of virtue, intelligence and even possessiveness over her husband — there was something quite distinct about 'Aa'ishah which drew the Prophet so close to her. The Prophet and his beloved connected as soul mates, as he received divine revelations often when he was with her. The fact that God blessed and ordained this marriage is evident in that the Prophet confessed to 'Aa'ishah that before marrying her, he saw her twice in his dreams. Both times, Angel Gabriel carried her to him in a silk cloth and said to him, that 'Aa'ishah would be his wife in this world and in the Hereafter (Al-Bukhari). Their blessed companionship came to a peaceful end after nine years, when the Prophet drew his last breath in 'Aa'ishah's arms. Upon the Prophet's demise, 'Aa'ishah's youth gave her the capacity to continue to preach Islam's message. The Prophet's demise may have ended their companionship in this world. However, it did not put a stop to his mission nor did it end 'Aa'ishah's role in carrying out her beloved's message. It was after the Prophet's demise that one can truly see the divine purpose behind this marriage. Because she spent the most formative years of her life with the Prophet, she was able to learn and imbibe all of his teachings. 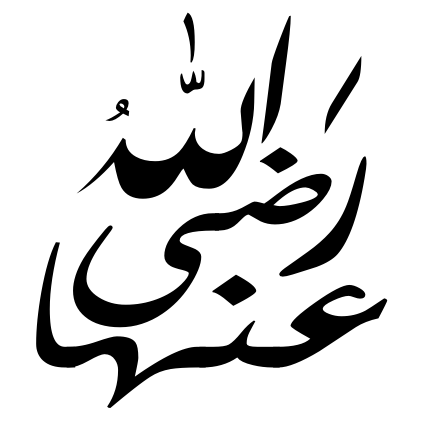 This became a tremendous asset after the Messenger passed away and was only possible because of 'Aa'ishah's age. Upon his demise, 'Aa'ishah's youth gave her the capacity to continue to preach Islaam's message for the many years she lived thereafter. Many companions of the Prophet and new followers of Islaam would come to Lady Aishah for advice on various Islamic matters. Her contribution in relating numerous sayings of the Prophet and providing clarification on questions related to faith soon catapulted her to the status of a prominent Islamic scholar. The love story between the Prophet Muhammad and Lady 'Aa'ishah provides a realistic perception of how true love can be found within a marriage. 'Aa'ishah's role in this marriage was one that God destined in order to ensure that the teachings of Islaam will be successfully transmitted to coming generations even after the Prophet passed away. The love story between the Prophet Muhammad and Lady 'Aa'ishah may not be what epic romances are made of, but it certainly provides a more realistic perception of how true love can be found within a marriage. The sole purpose of marriage in Islaam is to fulfill an individual's need for companionship and true love. Islaam emphasizes and encourages this fulfillment but only within the bond of marriage. The Prophet's marriage to 'Aa'ishah shows that intimacy and romance is not necessarily limited to rosy-eyed young dating couples. This blessed couple exemplified that the true love and companionship we all seek, is entirely possible within marriage and moreover, within the Islamic way of life. Today, this is a marriage which many may choose to slander or demean. Yet one needs only to take a look at the evidence Prophet Muhammad and Lady 'Aa'ishah left behind, in the form of numerous sayings they related, which testify so dearly to the love and intimacy they shared. The most famous love stories in this world are those that were a figment of someone's imagination. Yet this is a love which actually existed. It was a love created and destined by God himself. Ibn Al-Jawzy, Gamal Aldin. Safwat Al Safwah Vol. I.
Ural, Ali. "AISHAH: Lover of the Beloved." Accessed 30 Mar. 2008. Webb, Suhaib. Mothers of the Believers: Lives of the Wives of Prophet Muhammad. "You are what you click." A Simple Matter of Disagreement?